I'm home from the Preparedness Expo in Prosser, Washington. What a trip! What a time! Here's a view of the valley from the parking lot of the expo center (vineyards in front). Very lovely. Saturday, as you can imagine, was the busier day (the expo was held Friday and Saturday). It was clear the attendees were very interested in learning how to make themselves less vulnerable to natural, manmade, or economic disasters. The vendors reported excellent questions and serious interest. I had the pleasure of meeting many delightful readers. One lovely young couple came by with a trio of adorable boys. I asked permission to photograph the older two tykes (from behind) while they were involved in a vendor display. Oddly enough I didn't take any other photos of the expo. I was busy giving talks and visiting with both visitors and with Dave and Ilene Duffy of Backwoods Home Magazine (whose booth I was sharing). It was the first time I truly had a chance to get to know these fine people in person, and it's hard to express how much I enjoyed their company. Younger Daughter and Ilene Duffy took to each other like ducks to water, and often I'd come into the booth to find them sitting side by side, deep in conversation. Warmed my heart, it did. In the evening after everything was packed down, the very exhausted family who were mostly responsible for putting on the expo graciously invited Younger Daughter and me to a late dinner at their home. Everyone was pooped but we had a great visit, and didn't get back to the hotel until past 10 pm. This morning Younger Daughter and I hit the road for the five-hour trip back. 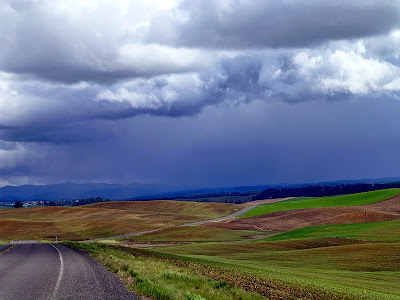 We drove past some of the most beautiful scenery imaginable, especially after we got into the Palouse. Younger Daughter kept the camera on her lap and snapped photo after photo after photo. Hard to resist such beauty, especially this time of year when the crops are starting to flourish. Gradually it changed to granite outcrops and escarpments. And then came the beautiful Palouse (mostly photographed through a dirty windshield, sorry about that). Some rainclouds darkened the horizon as we approached the Idaho border. We were very glad to be home but feel fortunate to have attended such a well-planned event. Glorious photos. What stunning colors! She's got a good eye! WOW!! that is beautiful Gods hand work. thank you for sharing with us I love reading your blog to start my day. Your newest banner photo is absolutely stunning! If there is a Preparedness Expo in Prosser in 2014, I hope you come back again! Oh and I am now part way through your book, reading it until I just had to shut off the light last night. I would stop and read a page to my husband. He'd say, "That sounds like you!" Yep, I always say some of the same things..."It's all about choices." I sure would love to have you for a neighbor...visits and laughter...I just loved your joyful spirit. Beautiful photographs!!!! I love the one you chose for your header. It was wonderful to meet you and we sure enjoyed having you at the expo, and younger daughter too!